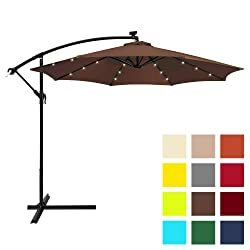 What is the best pool umbrella? The answer is…it will depend. There are a lot of things that you should consider when buying your pool’s umbrella. For instance, you need to look at the design of your pool, the furniture around your pools, and many other things. So, if you want to get the ideal model for your needs, then ride with us as we explore the top pool umbrellas on the market today. Here is a review of the top pool umbrellas on the market today to help you have a starting place when choosing your preferred umbrella. 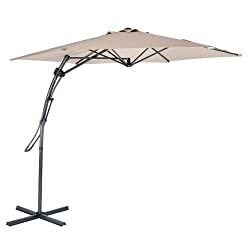 This umbrella comes with a 6.5 feet canopy, has an integrated anchor base pole, and it has a corrosion-free 32 mm diameter. Other features of this unit include a built-in sand anchor and two-piece aluminum pole that are rust-free. When you buy the umbrella, you will also get hanging accessories and hooks to keep all your items in places such as bags, camera, and towels. And the umbrella is made of 300D polyester fabric material with amazing valance for extra shade. When pole can be folded to 44 inches and offer a total height of 82 inches when fully opened. Another great feature of this gear is the fiberglass ribs that provide flexibility when the wind is strong and ensures that your umbrella doesn’t bend out. The Abba provides you with a 9 feet diameter-shade and can easily be stretched to a maximum of 54 inches high. It can easily serve a rectangle or square table with 4-6 chairs and is perfect for both commercial and residential use. Another great thing about this umbrella is the 100 percent post-consumer recycled polyester material. This material happens to be UV protected, water repellent and doesn’t fade easily. The gear also comes with corrosion-free powder covered aluminum pole as well as steel ribs. In fact, the 1.5 inches aluminum pole offers more strength support than ordinary poles. The crank mechanism for the close and open system also makes it an effective unit and is quite easy to use. It also comes with a push button. Abba Patio Rectangular is made of a polyester fabric that is UV resistant and lasts for years. 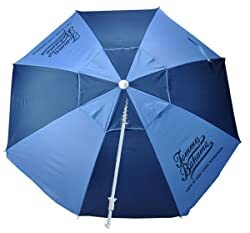 Another feature of this umbrella is the easy to clean nature and the material doesn’t fade easily. The gear comes with 8 feet by 10 feet in diameter and is perfect for rectangular, oval, and square tables. Being big, the umbrella can hold 6-8 chairs to ensure that many people remain under the shade. It also comes with an aluminum pole and eight steel ribs which are bronze covered, preventing rust, corrosion, peeling and chipping. The umbrella easily closes and opens with crank lifting technology and has a five-position vertical tilt function. Best Choice is a 10 feet premium offset gear that was designed to keep you under the shade and more comfortable than other umbrellas. The umbrella is made of waterproof polyester fabric and has a powder-covered aluminum pole. Another feature of this product is the steel bottom frame that keeps the unit sturdy even when the wind is strong. Furthermore, it opens and closes using the crank operation, enabling you to have an easy time with your umbrella. And you can use this gear outside for shilling by your pool or just to keep out the hot sun while relaxing outdoors. The unit pairs well with a 4-piece offset umbrella stand. 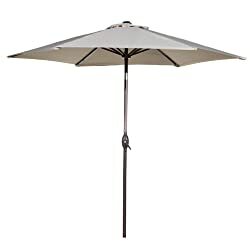 The pole this big patio umbrella measures 48 mm (1.89 inches) – ensure that your patio table hole can fit this gear. 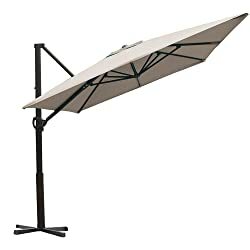 With a 14.7 feet diameter, you are assured of getting a more shade effect and the gear is made by extra-big double-sided. Moreover, the umbrella is perfect for both commercial and residential uses and is overall height is 8.9 feet. It works with the crank lift tech that enables you to close and open your umbrella with ease. The umbrella also comes with three wind events at the top to enable the air to flow freely and reduce the wind pressure, improving stability. Another notable feature of this unit is the 100 percent polyester material that ensures it lasts longer, remains fade resistant, and protects you from UV rays. The material is also very easy to clean and mildew and mold resistant. This unit comes with 24 built-in LED lights that are powered by the sun using solar panels situated on top of the umbrella. It also features a powder-coated aluminum pole that is water, fade, and UV resistant and its fabric is made of polyester. Furthermore, this model offers a second sun protection which you can easily enjoy when you use the hand-crack lift system which blocks the rays from all angles. Dual-function wind vents allow a cool breeze to flow via your umbrella and the easy to detach crank/pole make for easy assembly and storage. The unit pairs well with 4 pieces offset umbrella base stand. The MYAL 9 feet comes with a steel cross base but it doesn’t come with the weight. This base comes in handy to add stability and security to your umbrella or you can screw it to your deck beam. The gear is made of waterproof polyester material and is fade resistant. 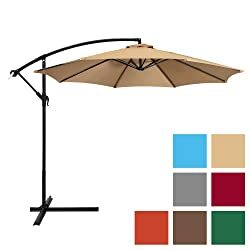 With this umbrella, you are assured of remaining comfortable and cool and it is ideal for the long-term outdoor purpose. Another great feature of this unit is the six steel ribs that provide it additional strength. The umbrella is very easy to store and comes in a compact design. What’s more, you can use it for both the commercial and residential uses. One final feature is the crank system that ensures smooth opening and closing. Market Patio Umbrellas – They are often seen as outdoor umbrellas and are the most common form of patio umbrellas. They have a straight pole that is located at the middle of the gear and rest in a base on the surface. 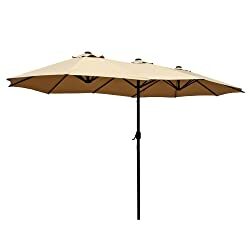 Offset Patio Umbrellas – These umbrellas have a pole on one side as opposed to the middle of the umbrella. Their shade moves from side to side. Q: What size pool umbrella should you buy? A: The size of the umbrella will depend on various factors. For example, you need to know the amount of space you have and the budget you have set. These are all factors that you need to take into account when choosing your pool umbrella. Q: Is a pool umbrella built to shelter user from the rain? A: No. These gears are built to shelter you from the hot sun. Although they resist water, you should never leave your umbrella open when it is raining. Q: How do I wash my pool umbrella? A: Wipe with a damp cloth to remove excess dirt and dust on the canopy and ribs. If the blemishes and dirt persist, use warm water and soap and clean with a cloth. A hose can also do the trick for quick cleaning. Q: Are pool umbrellas ideal for use during the winter? A: Yes. You can use your pool umbrella during the cold months. These umbrellas can help you stay warm during the cold months by preventing heat from rising up. Q: What should I consider when choosing pool umbrella fabrics? A: Always consider the intended usage, application, and storage. Durable fabric is perfect for all swimming pool uses. Choosing the best pool umbrella can be a complicated process if you don’t know what you are looking for. To help you get started, we have reviewed the top 7 pool umbrellas on the market today. All these models will offer value for your money.